We had a simple Valentines Day this year and stayed home with the kids and devoured Chicken Tamale Skillet Casserole and cuddled up on the couch with Strawberry Grapefruit Mimosas to watch Armageddon. Sometimes I love simple just as much as I love to get dressed up and go out. My slippers where much more comfortable then dress shoes and we didn't have to wait on a table that Colt has reserved 3 weeks prior. This last year I've learned to be greatful for the small things, the little love notes he leaves me and phone calls home. 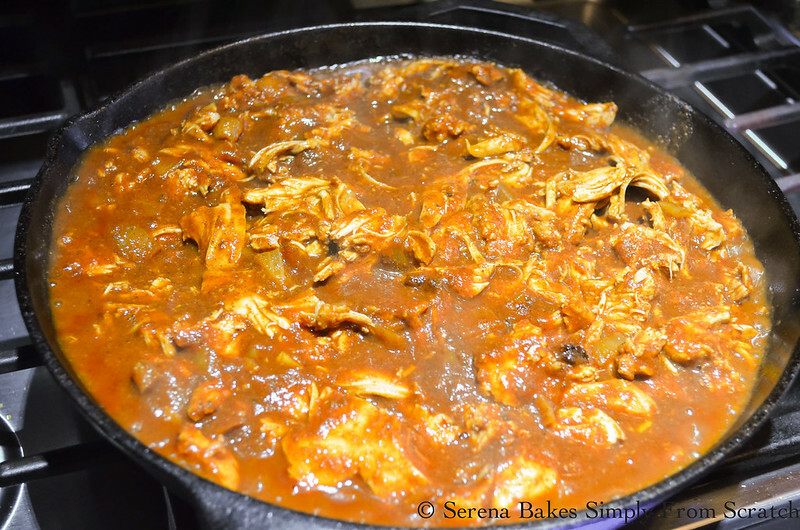 I couldn't think of a better dinner to tell him I love him then this Gluten Free Tamale Chicken Casserole, we both love Mexican food and this recipe is comfort food at it's best. Cornbread covered in chicken cooked in homemade enchilada sauce and then smothered with cheese. Sometimes it's the little things you have to take time to enjoy and this casserole is one of those things. The only down side to this casserole is we both decided we wanted the leftovers for lunch on the same day but Colt beat me to them. Next time I'll make sure to hide them better. 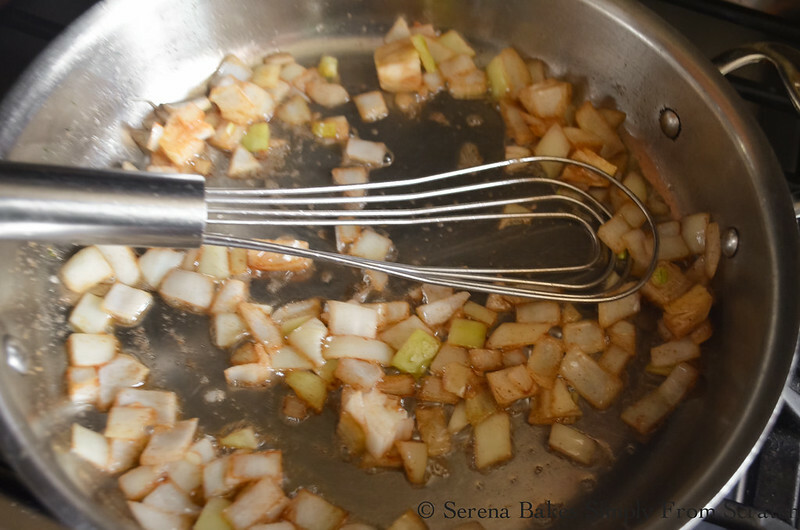 Saute onion in butter until starting to caramelize over medium heat. Add minced garlic, 1 tablespoon corn flour and chili powder. Stir for about 1 minute until fragrant. Stir in 1 1/2 cups water slowly making a smooth sauce. 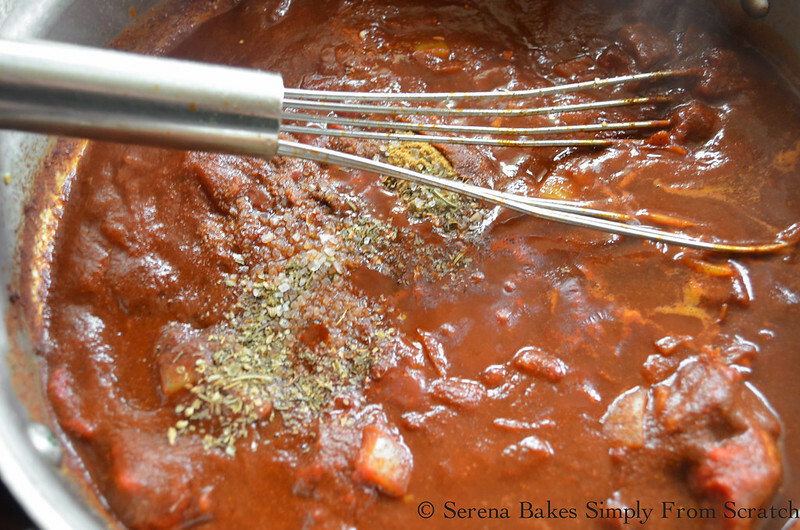 Add tomato paste, oregano, cumin and salt. Stir until smooth. Tuck 3 chicken breast into the sauce and spoon sauce over the top. 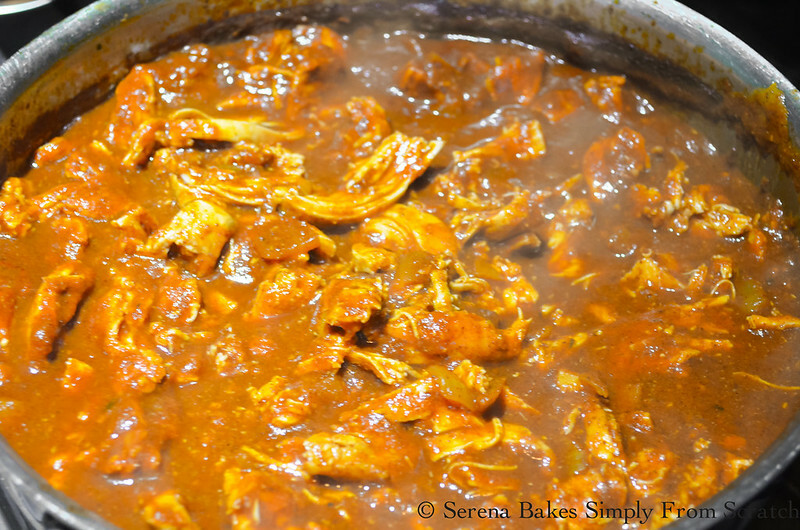 Bring to a simmer turn heat to low, cover and cook for 40-45 minutes until chicken is tender and shreds easily. If using frozen chicken breast like me it may take up to an hour to cook until tender. To make the corn bread layer, melt butter and combined with honey. In a large bowl combine GF cornmeal, GF corn flour, sugar, and salt. 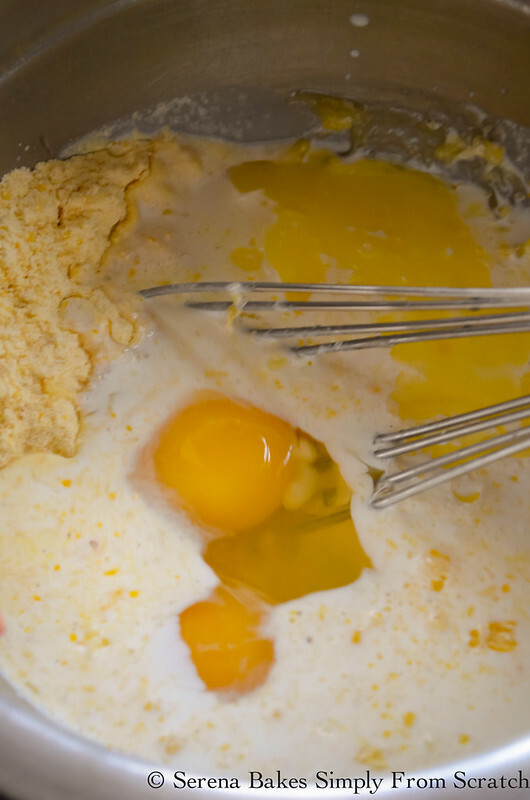 Add butter/honey mixture, milk and eggs. Mix until well combined. Butter a large cast iron skillet. 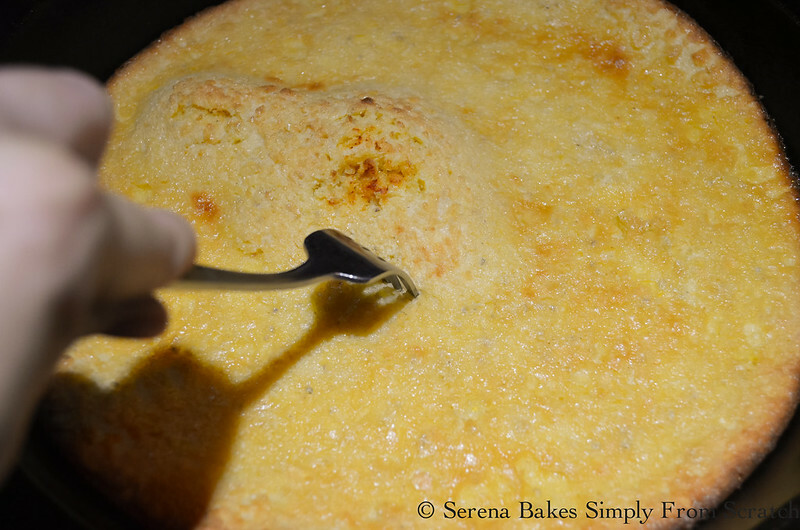 Add cornbread batter and bake at 400 degrees for 15-20 minutes until lightly brown and a toothpick inserted into the center of cornbread comes out clean. Once chicken breast is tender shred with 2 forks. Remove corn bread from oven. Poke holes all over so the enchilada sauce can seep into the cornbread. Cover with chicken and enchilada sauce. Cover with 1 cup cheddar cheese and 1 cup white cheese. I used mozzarella this time because I had a huge loaf needing to be used but I prefer jack but sometimes you just have to use what you have on hand. Enchilada Chicken Cornbread goodness smothered in cheese..
Be warned if your lucky enough to have leftovers hide them very carefully deep in the vegetable draw or your husband might eat them before you..
Just say'n cause we're friends like that. 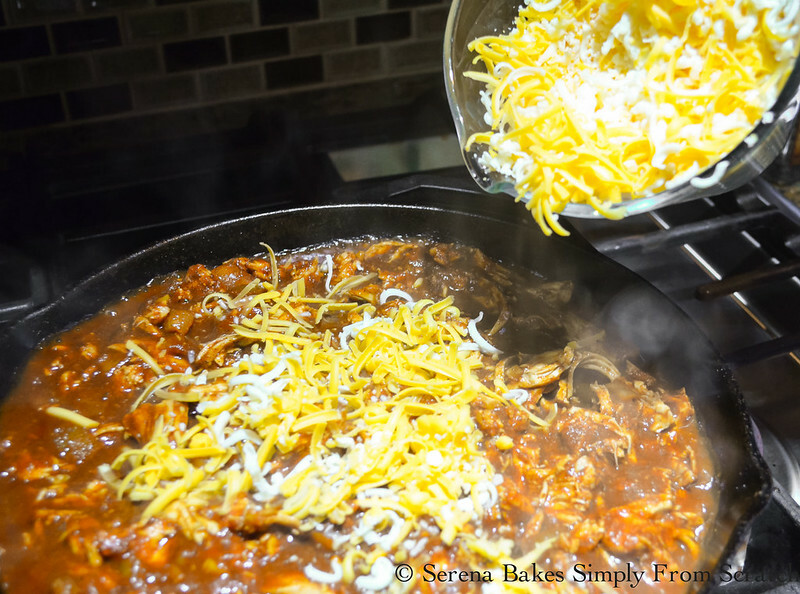 Gluten Free shredded chicken in an easy homemade enchilada sauce over the top of cornbread and smothered in cheese. A favorite of young and old alike. 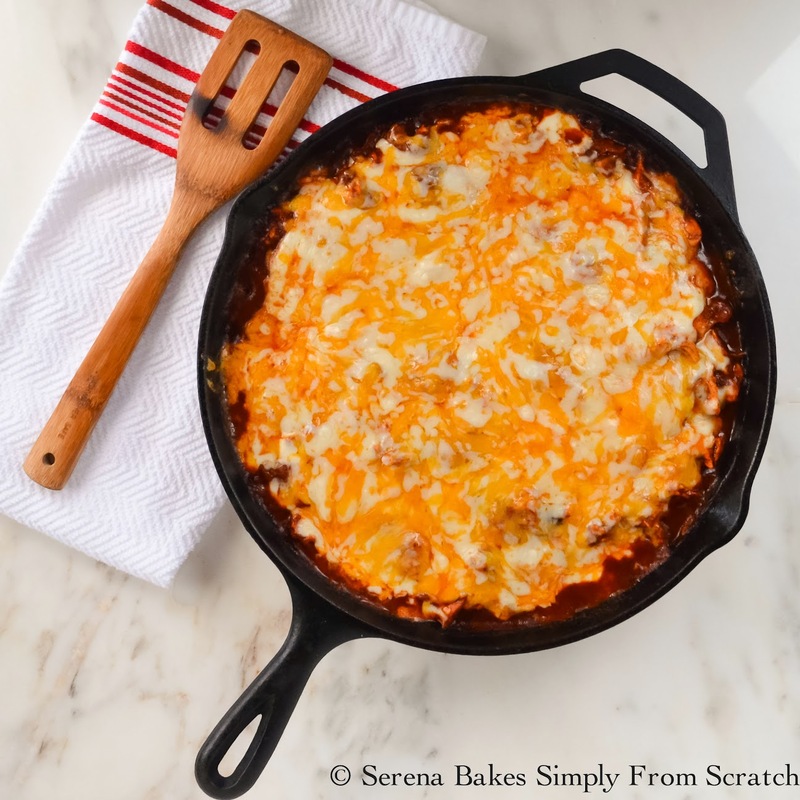 In a large skillet with a lid melt butter. Add onion and cook over medium heat until onion starts to caramelize. Add garlic, chili powder and 1 tablespoon corn flour. Stir until fragrant about 30 seconds to 1 minutes. Add water, tomato paste, oregano, cumin and salt. Stir until well combined. Add chicken breast. 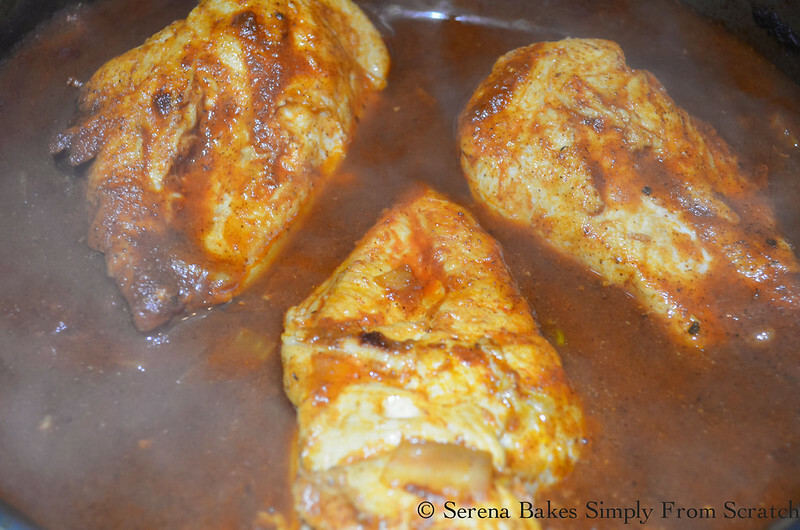 Cover both sides of chicken breast in sauce and bring to a simmer. Reduce heat to low and cover. 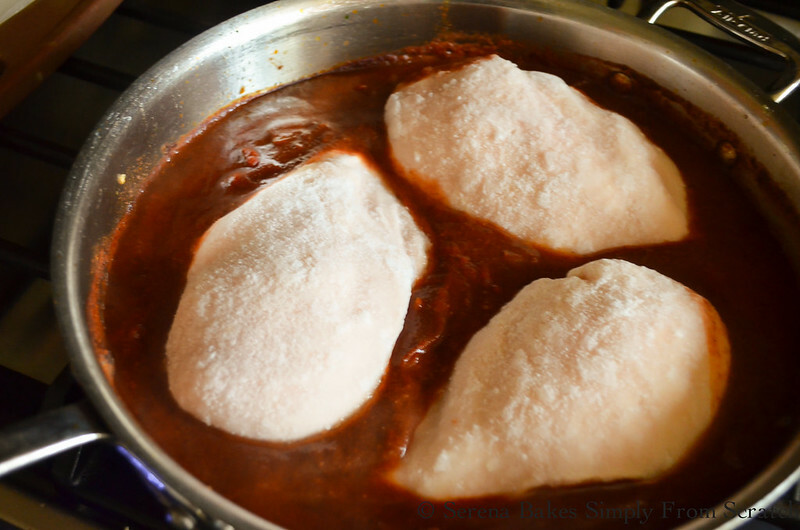 Cook chicken for 30-45 minutes for fresh chicken or 45- 60 minutes for frozen chicken. Once chicken is done shred with 2 forks. While Chicken Cooks: Preheat oven to 400 degrees. Butter a large cast iron skillet and set aside. In a large bowl combine 1/2 cup corn meal, 1 1/2 cups Corn Flour, sugar and salt. Mix melted butter with honey until well combined. 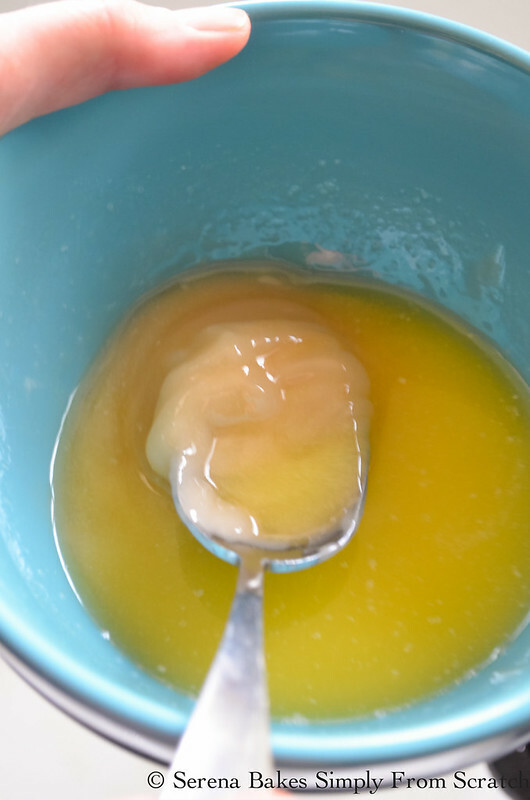 Add butter/honey mixture, milk and eggs to bowl and stir until well combined. Pour corn bread batter into greased cast iron skillet and bake for 15-20 minutes until a toothpick inserted into the center comes out clean. 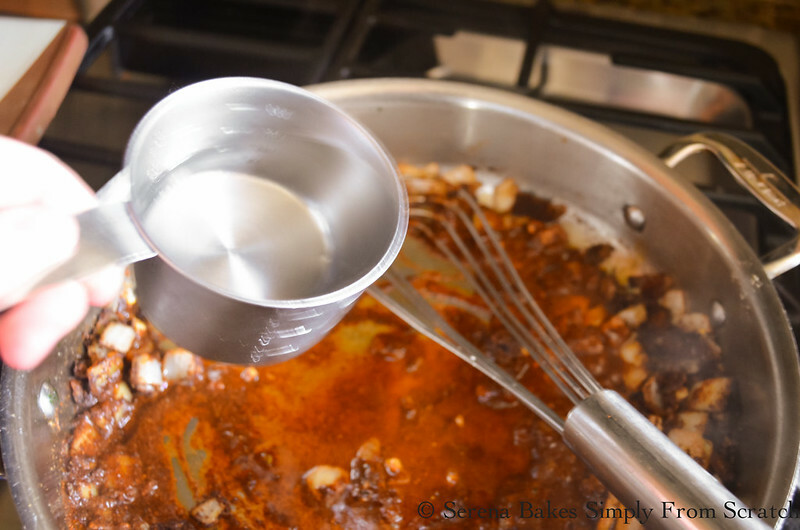 Use a fork and poke holes all over corn bread to give holes for the enchilada sauce to soak into. Pour pulled chicken and enchilada sauce over the top of corn bread. Top with shredded cheese and place back into oven for 10 minutes until cheese is melted and starts to brown.